1. Self Aesthetic Silky Hair Mask: Hair cap type mask to offer nutritious hair care at home. 2. Self Aesthetic Collagen Hydrogel Eye Patch: improving skin elasticity of eye areas. 3. Self Esthetic Butterfly Nose Pack: Big size nose pack that can also take care of skin around nose. 4. Self Esteemed Rose Hydrogel Lip Patch: An easy and convenient home care lip patch. 5. Self Esthetic Clear Clean Bubble Mask: Carbonated bubble massager removes skin wastes. 6. Self Esthetic Water Full Facial Mask: A facial mask that can provide moisture care, radiance and relaxing. 7. 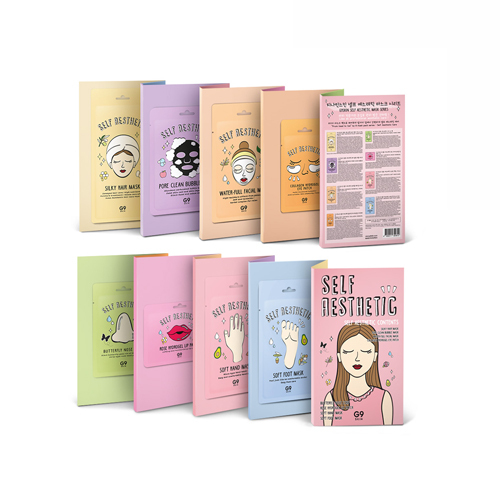 Self Esthetic Soft Hand Mask: Home care hand mask to turn dry and rough skin to smooth skin. 8. Self Esthetic Soft Foot Mask: Home care foot mask to turn dry and rough skin to smooth skin. Please refer to the detail image of each product.